The scene is not one any cardinal wants to consider: a prince of the church, his bare chest branded with a cultish symbol, burned to death as he hangs spread-eagle above the altar in a Roman church. 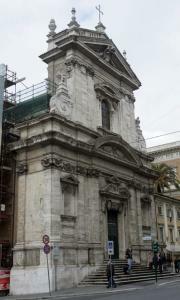 But, in a strange confluence of popular culture and Boston Catholicism, that very scene in this weekend's grisly blockbuster movie, "Angels & Demons," takes place in a charming baroque church in Rome, Santa Maria della Vittoria, which is overseen by Cardinal Sean P. O'Malley, the Roman Catholic archbishop of Boston. O'Malley, like many Catholic prelates, has taken a generally dim view of the wildly successful Dan Brown oeuvre, which portrays the Catholic Church as a powerful and monied institution at odds with history and science. The Vatican has been less critical of "Angels & Demons" than Brown's more famous bestseller, "The Da Vinci Code," in part because its subject matter is less theological and in part to avoid generating free publicity for the film. O'Malley's posture toward author Dan Brown (a real-life resident of Exeter, N.H.) and Robert Langdon (the fictional hero of both books who supposedly teaches "religious iconology" at Harvard) is more complicated. Although the cardinal has called the books outrageous, his church in Rome, which is somewhat off the beaten path despite housing a spectacular and rapturous Bernini sculpture, also benefits from their success, because tourists donate money. But the benefit goes only so far. "I am not getting any royalties," O'Malley noted wryly. "It was only after I took possession of the church that the friars told me that they were on the 'Angels & Demons' tour and that there were streams of Americans coming through the church, more than ever," O'Malley said in an interview this week. "If people are visiting the church, I don't think that's a bad thing. I just hope they don't believe a lot of the things that Dan Brown writes about." O'Malley oversees the 17th-century church in his capacity as a cardinal; every Catholic cardinal is assigned a church in Rome, in a largely symbolic practice that is intended to echo the early days of Christianity, when all the cardinals were Roman pastors. O'Malley's coat of arms now hangs above the church's doorway, and he said he now visits and says Mass there, in Italian, about twice a year. O'Malley's church is featured prominently in the film for about 10 minutes, but the structure shown in the film is not the real one. Because the Vatican barred director Ron Howard from shooting on church property, including Santa Maria della Vittoria, filmmakers built their own version of the church on a stage at the Sony Pictures lot in Los Angeles. Production designer Allan Cameron said in notes released by the studio: "The real Santa Maria Della Vittoria in Rome is quite small, and the action that takes place there in the film is quite complex . . . so we had to enlarge the aisles and enlarge the nave and make it slightly bigger than the real one just to accommodate the action." The film crew also built a styrene reproduction of the church's world-famous marble sculpture - Bernini's Ecstasy of St. Teresa, a staple of Art History 101 texts - which functions as an important clue in the protagonists' quest to save the Vatican from imminent destruction by finding the location of a hidden explosive device. "That Bernini statue is one of the most valuable statues in the world," said O'Malley, who has already sold off the Archdiocese of Boston's headquarters property and dozens of churches and is still running a deficit. "I told the friars I wanted to bring it back to Boston and auction it off, but they informed me that Napoleon wanted to bring it back, and he was stopped because his uncle was the cardinal of the church." O'Malley is a sometime consumer of nonliturgical literature, who likes to work references to books or television into his homilies. "I usually don't go to movies, but I read about them," he said, "because I think popular culture is important and I try to keep up with what people are seeing and talking about." His own leisure reading is often in Spanish, Portuguese, or French, and he gravitates toward foreign films, although, he allowed in the interview, "I do like a good car chase." O'Malley said he read both Dan Brown novels before becoming a cardinal and before knowing that Pope Benedict XVI would, in 2006, assign him to oversee a church featured in "Angels & Demons," a thriller about a single day in which the Harvard symbologist and a lovely Italian scientist attempt to thwart what they believe is a plot by antireligious scientists to blow up the Vatican and kill all the cardinals after the death of a pope. The Brown books have been enormously successful. "The Da Vinci Code" has sold 84 million copies, and the poorly reviewed film version, released in 2006 and starring Tom Hanks, earned $750 million worldwide. "Angels and Demons," which had been published before "The Da Vinci Code," became a best seller in the later book's wake. Expectations for the film, also starring Hanks, are high despite weak critical buzz. "My sister gave me the books because she said all the book clubs were reading them, and she was very concerned, particularly by 'The Da Vinci Code,' which is what I consider very anti-Catholic in its presentation of the church and which, of course, attacks the basic tenets of our faith," O'Malley said. "And I was disappointed by the endings. I used to teach literature, and endings are important." O'Malley has discussed his church's relationship with the book twice before; in an interview with Boston.com in 2006 and on his own blog last month, where he drily noted, "Portions of the plot take place in my titular church in Rome," and said, "I read the book a few years ago, and I didn't find it a great piece of literature."